SEND an Email to members of the Harrisonburg City Council with a quick and easy copy & paste of our form letter. SEND a personal email to your city council members by incorporating our talking points into your email. Help Grow the Party– We are compiling a list of local businesses and organizations who support Connecting our Schools. Have interest? Know someone who might be interested? SHOW UP– We plan to show our support for connecting our newest school at a City Council Meeting in March. We don’t know the exact date yet but Join our Facebook Event and Stay tuned because we will be sure to let you know when we need your support! JOIN- the Shenandoah Valley Bicycle Coalition to help us continue working with our city, county, and National Forest to improve our community for biking and walking. DONATE- We are an all-volunteer non-profit and need your support to continue improving Biking and Walking in our community. The City of Harrisonburg has the opportunity to fund and construct several shared-use paths in the vicinity of Garbers Church Road in tandem with the 2017 opening of the City’s newest elementary school. These walking and bicycling paths would connect Harrisonburg High School, Thomas Harrison Middle School, and the future elementary school to the rest of the City. Project 1: Paths along Garbers Church Road, likely a sidewalk north of the new elementary school, and an asphalt paved path along Garbers Church Road south of the new school. Project 2: Connecting from Hillandale Park around the perimeter of Heritage Oaks Golf Course and to Garbers Church Rd shared use paths. Also a connection from Hillandale Park to the Wyndham Woods Neighborhood. Project 3: “Cale” Trail and connections to Thomas Harrison Middle School. One or more of these connections may be natural surface and will connect Thomas Harrison to Wyndham Woods and Westover Park. Why are these trails important? These three projects combined would serve over half of the Harrisonburg city school population by providing walking and biking connectivity to Harrisonburg High School, Thomas Harrison Middle School, and the newest city elementary school. We wouldn’t build a school without a road so we shouldn’t build without cycling and walking connections either. Planning for these connections began over a decade ago. These paths and trails have been specifically laid out in the City of Harrisonburg Bicycle and Pedestrian Plan since 2010 but the need for connections to these schools was identified as a component in the plan since 2005. City staff estimates the total cost of all three projects featured on map to be roughly $3 million. While that seems like a lot of money, it is important from a sustainability standpoint that these types of construction projects are executed in a manner that won’t require frequent maintenance and maximizes the safety of all users. Grant opportunities for bicycle infrastructure are significant and should be pursued whenever feasible. Funding for cycling and walking accommodations can and should enjoy the same funding sources and conventional road funding. The best time to plan for and implement bicycle infrastructure projects is concurrently with other capital improvements (whether building schools, widening roads, or other public amenities.) This both reduces overall construction time and lowers total costs, as all infrastructure improvements can be jointly financed. Just like part of the overall budget for a new school includes a road to get there and parking lot once you arrive, we believe it should always include appropriate bicycle and walking access. I heard that the city was applying for a grant to fund these projects? You heard correctly! Fortunately, our city already values biking and walking connections. City staff, with the support of council, applied for a VDOT Revenue Sharing Grant that would cover half the cost of the project (roughly $1.5 million) with the remaining $1.5 million to be matched by the City. If awarded, the revenue sharing grant, the city will have full funding to complete all three Garbers Church Projects. You can read specifics about the city’s application in the November minutes from the Harrisonburg Bicycle and Pedestrian Subcommittee. The discussion is found on pages 2-4. 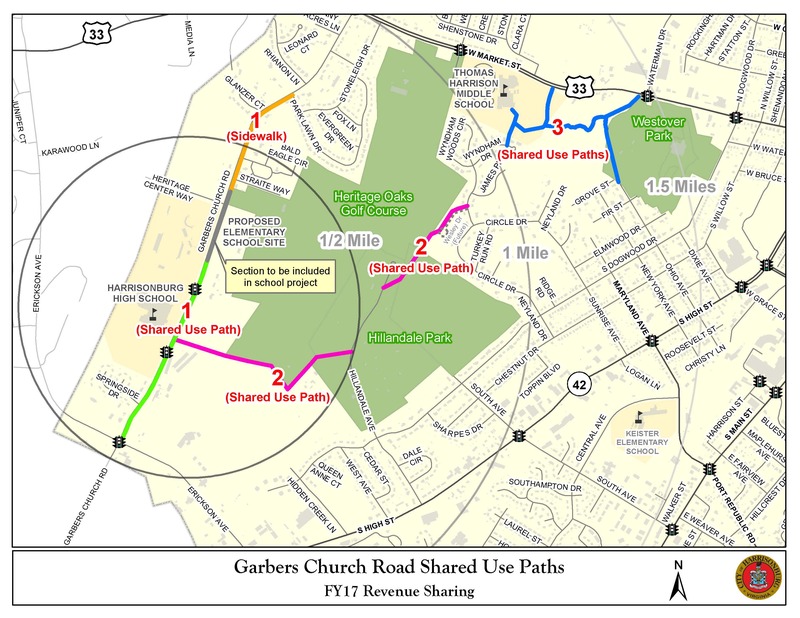 The Garbers Church Road Shared Use Paths receive third priority out of five projects. The city will know by June whether or not VDOT will be awarding us the grant. What is the timeline for this Issue? The City is planning to open our newest elementary school in fall of 2017. That means that funding for these paths will likely need to be underway in the next few months. That said, we can’t stress enough our goal to have these trails completed by the time the school opens. //What will the trails look like? The recently constructed Bluestone Trail is a great example of what these “greenways” or shared use paths would look and feel like whether on a bike or on foot. We imagine the majority of these trails to be paved while some may remain natural surface depending on the surrounding environment. I thought we were already a “Bicycle Friendly Community”? Why do we need all of this? HARRISONBURG — A campaign to build a sidewalk and several shared-use paths around the city’s future elementary school and Thomas Harrison Middle School is gaining traction. The Connect Our Schools petition, organized by the Shenandoah Valley Bicycle Coalition, recently opened to signatures online. It calls on City Council to build three projects by fall 2017, when the new elementary school is slated to open. The first project includes building a sidewalk on Garbers Church Road linking the site of the future elementary school near Heritage Oaks Golf Course to the neighborhood north of it. A paved shared-use path would be built starting from the school and extending south past Harrisonburg High School before connecting to Erickson Avenue. A second project would add a shared-use path starting from the proposed path in front of the high school and extending east around the perimeter of Heritage Oaks to connect with Hillandale Avenue at Hillandale Park. A separate shared-use path would link Hillandale Avenue farther north with the Wyndham Woods neighborhood. The third project would create the Cale Trail, which would connect Thomas Harrison Middle School with Wyndham Woods and Westover Park, about a mile east of the school. The proposed trail is named after Dr. William Cale and his wife, Susan, who donated 12.8 acres for the path. The city has applied for a revenue sharing grant through the Virginia Department of Transportation, which would fund half of the estimated $3 million cost for all three projects. City officials will know by June whether they will receive the grant, according to the campaign’s website. The website says the projects would connect more than half of the city’s student population with walking and biking paths to elementary, middle and high schools. The campaign, which had more than 585 signatures on Sunday, seeks 1,000 signatures from city residents by early March. Thomas Jenkins, co-owner of the Shenandoah Bicycle Company and a member of the bicycle coalition, said the coalition plans to present its proposal to City Council in March, requesting it commit to completing the projects by 2017. Jenkins introduced the projects to a group of 10 residents at a campaign launch event at Shenandoah Bicycle Company on Thursday. The event also included an update on Harrisonburg’s bicycle and pedestrian plan. The plan, which includes a list of proposed infrastructure projects, was last updated in 2010. An updated plan is expected to be finished at the end of this year. Projects completed in the 2010 plan include the addition of bicycle lanes on South Avenue and Main Street, the first phase of the Bluestone Trail shared-use path, and Safe Routes to School initiatives. While the paths proposed by Connect Our Schools have been in the plan since 2010, Jenkins said, the need for them has been identified in plans as early as 2005. Those attending Thursday’s event said they support the campaign. Carl Droms, 63, a member of the bicycle coalition, said the paths are needed to give students more options than riding the school bus or being driven in cars.